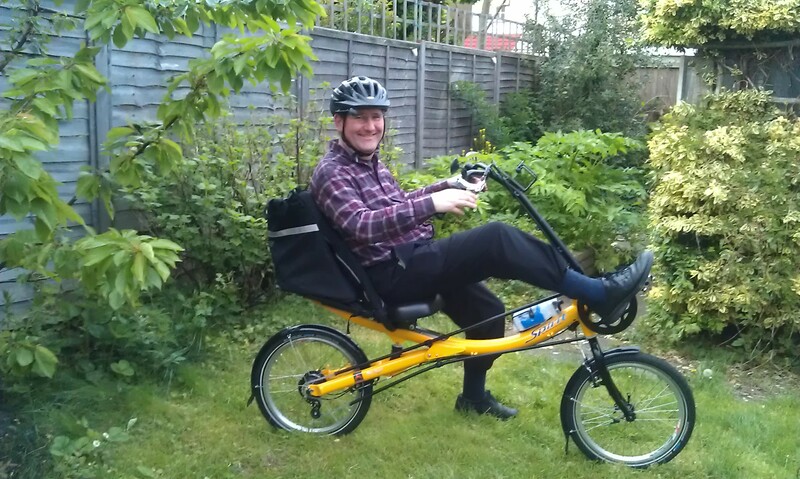 This blog is about how and why I chose to ride a recumbent bike (Bob), my experience of making the transition from upright bike to recumbent, and some of the journeys / adventures I’m hoping to have with my new steed. As for the names… My own, David, is easily explained – it was donated by my parents. But Bob? Bob is my new (at time of writing) bike – a brand new HP Velotechnik Spirit with a 14 speed Rohloff hub. When I arrived home my 12 year old daughter got very excited and demanded to know what he was called. I struggled to think of something lofty and inspirational or aspirational. My daughter just cut to the chase and said “I think we should call him Bob”. So Bob he is. Somehow it seems very appropriate given that when I go over a bump in the road the suspension on the bike means that I do bob up and down somewhat. My history of regular back problems. The different reach of my arms after my right elbow was smashed by a hit-and-run driver means that I can easily end up cycling slightly skewed to one side – not good for the back. My dodgy elbow isn’t good for resting any weight on. OK for short distances, not so good for cycling the 25 mile round trip to and from work. The recumbent I chose is extremely comfortable and ameliorates all of the above problems. Recumbent bikes are different, quirky, not mainstream, designed and ridden by people who like to see the world from another perspective. Are hugely good fun to ride! And what’s compensation for? I was kept off the road for quite some time as a result of a hit-and-run driver turning left where he shouldn’t have done. Why would I not go out and get an even better and more enjoyable bike than I had before? I’ll leave it to you to decide which you think are the real reasons and which are the justifications. This is a good story and , whatever the real reasons it is a great bike to have. I was on the ride. I am not a very regular cyclist. I started riding some years ago and still feel unsafe to cycle on roads. I don’t think i will be using my bicycle for a while, since the fall shortly before the turnback at the no cyclist park (10 minutes ride before the end at Swan Lane. I smashed my elbow and fracture some bone., not from inexperience but because my cycle skidded on an angle as i mounted the wet pavement. If my elbow is still not quite flexible enough to ride in future, I should need to buy a bike like your Bob! Many thanks for your comment Marie. I didn’t see the fall – I came past after you’d gone down – but I’m really sorry to hear that it’s had such a serious outcome for you. My top tip is to really go for whatever physiotherapy exercises you’re given when you get to that stage of treatment. They can be painful, but it’s only by pushing it that you get your joint’s mobility back as soon as possible. At the end of my first session my physio said to do the exercises at least three times a day. I asked what the optimum amount of exercise would be as opposed to the minimum and he immediately replied “Once every two hours”. I simply set the alarm on my phone for that and was pretty consistent about sticking to it – and it really does make a difference. Unfortunately the way my elbow healed I can’t straighten out my arm any longer – it’s about 25-30 degrees out. I hope you have better luck with your arm and that’s you’re able to get out and about on your bike as soon as possible – even if it’s on some of the greenways rather than the roads. Cycling is such a pleasant way to travel and cover distances not possible on foot. I thought recumbents were supposed to be slow up hills? Adventures with punctures in Welham Green… and Little Berkhamstead…and at home!